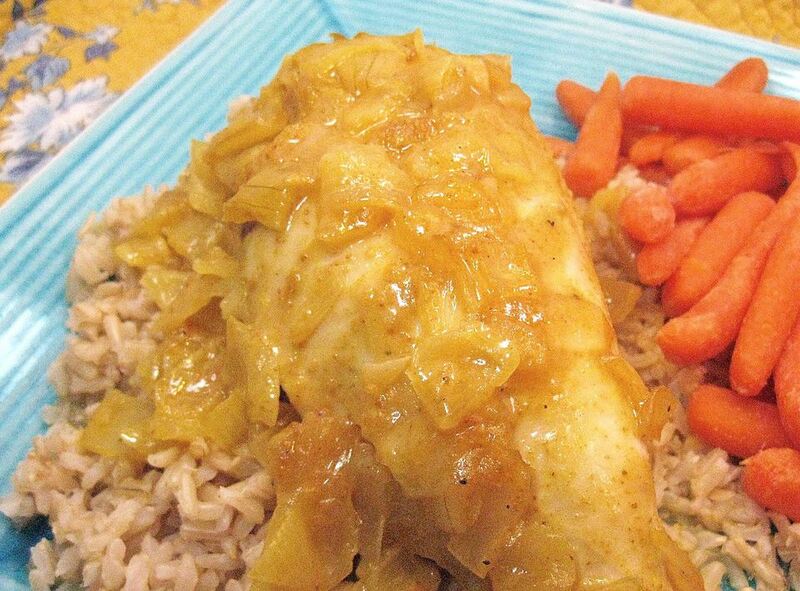 Baked Honey Mustard Chicken is a super easy five ingredient recipe that makes moist chicken in a flavorful sauce to serve over rice or pasta. If you love this flavor combination, make sure you check out my Favorite Flavors: Honey Mustard. There's something so wonderful about a recipe this simple that makes such a delicious dinner. You just make a simple sauce in the microwave, pour it over chicken in a pan, and bake. While the chicken is baking, you can make a side green or fruit salad, or steam some green beans, carrots, or asparagus to serve on the side. Some toasted garlic bread would also be delicious with this tender and moist chicken. When you buy the chicken for this recipe, make sure that you are buying boneless, skinless breasts that are only about 6 ounces each. There are some monster chicken breasts on the market that are only good for stewing or braising. If you try to bake these breasts, as I found to my chagrin, the chicken will never get tender no matter how long it's cooked. You could add more ingredients so this sauce if you'd like. Add some minced garlic to cook with the onion, or add some baby carrots or sliced carrots to cook along with the chicken. And the sauce can be used with other meats. Try it over a pork tenderloin that you bake to 145°F, or use it with fish. It's very versatile and flavorful. This easy recipe is special enough to serve for company, and simple enough for a weeknight dinner with the family. Serve with a glass of iced tea or white wine for a wonderful meal. Preheat the oven to 375°F. Grease a glass baking dish that is 9" x 13" and set aside. In a small microwave-safe bowl, combine the onion with the butter. Cook on high power for 2-3 minutes until the onion is tender. The onion may need more cooking time; just stir and return to the microwave. Remove the bowl from the microwave and add the honey, mustard, salt, pepper, and curry powder; mix well. Place the chicken breasts in a single layer in the prepared pan. Pour the sauce evenly over the chicken. Bake, uncovered, for 32-37 minutes until chicken is thoroughly cooked to 165°F as tested with a food thermometer. Serve the chicken with the sauce.